When he was refused entry to a bus because it was stopped at lights a 19-year-old man got the doors open and punched the driver. 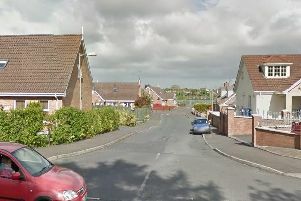 Robert Cochrane, whose address was given as the Bluestone Unit, Lurgan Road, Portadown, was fined £50 last Friday at Craigavon Magistrates Court for assault on June 22 last year. The court heard the defendant tried to board a bus at High Street, Portadown, but was refused because it was stopped at lights and not a bus stop. Cochrane managed to open the door and punched the driver on the face. A solicitor representing the defendant, who did not appear in court, said he was detained under the mental health act at the Bluestone unit. He explained that Cochrane was allowed 15 minutes outside in the grounds of the hospital but on this occasion had gone outside the grounds. He had been missing for an hour when this incident occurred. The solicitor added that Cochrane told police he was on medication and wanted to get back to Bluestone. He was likely to be in the unit for the foreseeable future. District Judge, Mr Mervyn Bates, said he could not impose a conditional discharge because the defendant needed to be in court.